Can Peter Sue The Bachelorette for Breach of Contract? 08 Aug Can Peter Sue The Bachelorette for Breach of Contract? Whether you watch The Bachelorette or don’t, chances are you’ve come across The Finale on social media this week. If you haven’t already, you will at some point soon. It is a show built around the premise of one woman looking for true love in a group of eligible bachelors that are looking for the same. The current season just ended with the Finale of the show airing earlier this week. Now, for some this show is straight forward: girl meets guys, girl chooses guy, girl and guy live happily ever. But from the perspective of a lawyer, The Finale raises more than a few questions that surely were not the intent of the show’s writers. For example, one might catch themselves wondering: can the runner-up sue The Bachelorette? 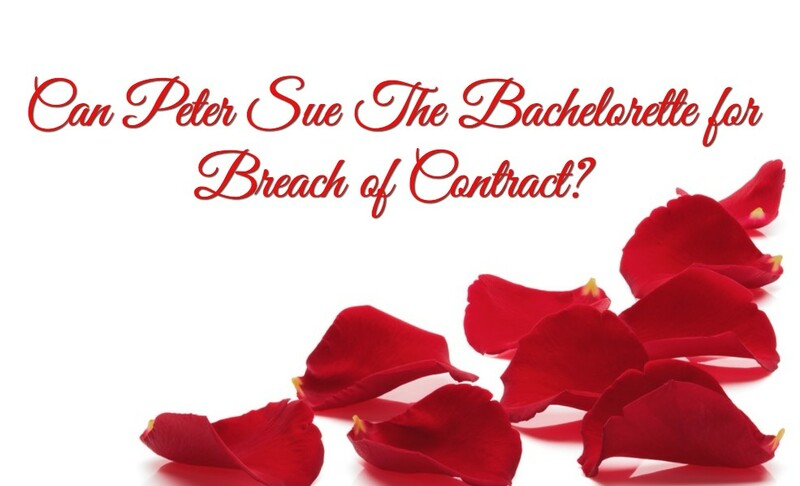 For Peter to sue The Bachelorette for breach of contract after The Finale, he would have to show that (1) a contract existed between Peter and The Bachelorette, (2) that Peter did everything on his part of the contract, (3) that The Bachelorette either failed to carry out its end of the contract or did something that the contract prohibited, and (4) that Peter suffered damages because of The Bachelorette breaching the contract. If the contract said that “Peter would court The Bachelorette throughout the show, and The Finale would secure an engagement between Peter and the bachelorette herself,” he might have a claim. If Peter did everything the contract required of him to court the bachelorette until The Finale episode, and The Bachelorette failed to secure his engagement and allowed the next guy to be “chosen” for marriage, then Peter is making serious progress with his claim. Finally, if Peter suffered damages beyond a broken heart from all of this (such as reliance upon this contract which caused him to decline offers of marriage from the hundreds of other women we assume had propositioned him during The Bachelorette season), then Peter may have successfully proven a claim for breach of contract against The Bachelorette. But, we can be all but sure this isn’t the case, and the contract drafted by the network are air-tight and state-of-the-practice. We apologize, Peter, if we got your hopes up – but keep in mind, you should not consider any of this as legal advice and should always consult your own attorney for legal matters (preferably not the bachelorette herself – we’re sure she’s a great attorney, but that might be a huge conflict of interest).